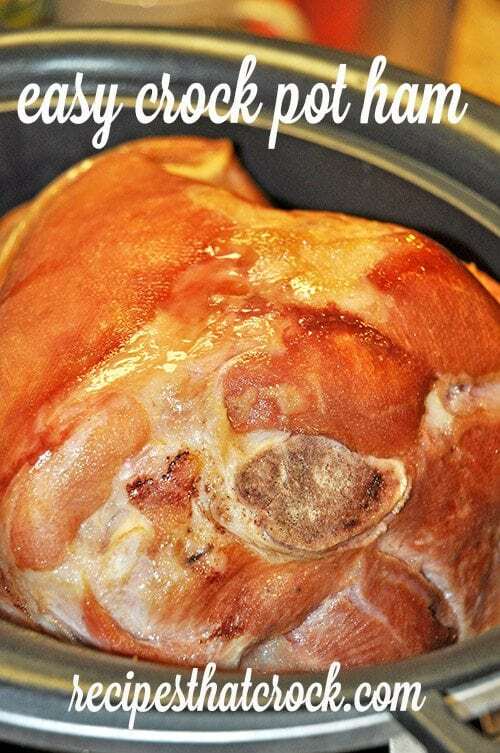 Easy Crock Pot Ham - Recipes That Crock! This three ingredient Easy Crock Pot Ham will have you enjoying all your favorite ham dish recipes in no time flat. No, seriously now, I really started thinking about all the yummy dishes you could make with a good ham. And, since this ham would not be feeding a holiday crowd ahead of time, I was pretty sure I could get a whole lot of great dishes out of one ham and stay under my $50 budget. Now ham is not traditionally what I think of when I think of a budget restrained purchase because they can easily cash in at $25 if you aren’t careful. But I had a hunch that with a bit of looking I could find a good price and that ham could stretch my dollar in the long run. Immediately I decided I was going to get a picnic ham instead of the more expensive spiral hams. Truth be told, I really very much prefer my hams non-spiraled– just ask Aunt Lou. Maybe it is nostalgia, but I really just enjoy cutting them myself. I found a nice picnic ham for $1.88/lb and it really gave me a lot to work with… You will find picnics will be cheaper than traditional and spiraled hams because they have more skin, fat and bone. But I had plans for all that 😉 So I didn’t mind that one bit. But it all started with the ham. For my ham recipe, I just altered the recipe for Brown Sugar Holiday Ham from Gooseberry Patch’s Hometown Christmas Cookbook. I omitted the $8 a bottle pure maple syrup and decided to just use the pineapple juice from the pineapple slices I planned to use later in the week for another recipe along with the brown sugar. The results were fantastic and the perfect base for all my yummy dishes. Now, I will probably still splurge with the maple syrup around the holidays, but this way was very good without the added expense. 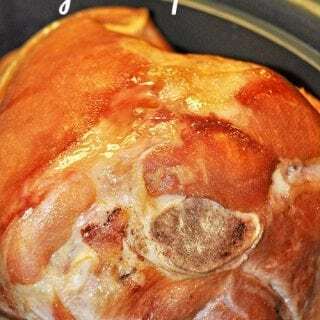 Super easy ham in a crock pot recipe! Pour juice over top and pack ham with brown sugar. do you trim any of the skin and fat off the ham before placing in crock pot? Please put me on your email list. Thanks. 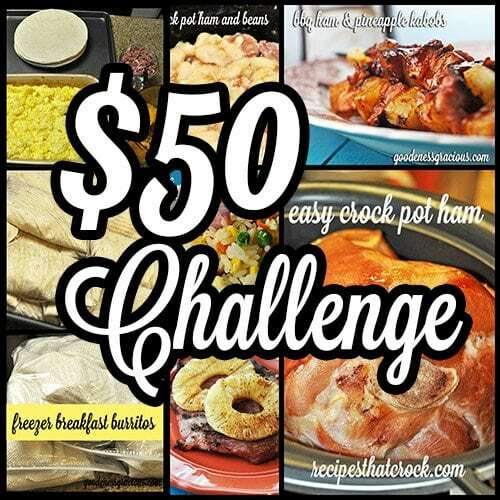 So glad to hear that you are using all the recipes from the challenge!! Just press the brown sugar down on the top of the ham and it will melt over top of the ham as it cooks. Enjoy! I made this for my 87 yr old MOM – who adores ham; and she and I both loved it. Thanks for sharing. Thanks so much for sharing this great post at Weekend Potluck party. Sounds so yummy…..please come back again soon. Thanks! And thanks for dropping by! !